How do the band and DJ work together? As the owner of a company that provides live music and DJ services, it’s often one of the first questions I hear. 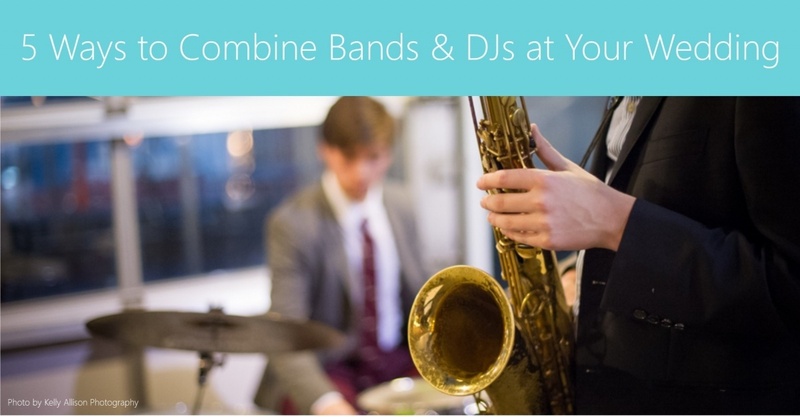 The truth is, there are lots of ways to combine live music and DJ services. Some approaches are all about creating a “big moment,” some build the energy throughout your party, and still others focus on offering the greatest variety of music for guests to enjoy. At Backthird Entertainment, we've chosen to focus on small live ensembles - 3 or 4 people playing live jazz or pop strings - for "listening music" while we leave the dance music to your DJ. The specific ratio of live music to DJ music is entirely up to you - but here are 5 ways that have worked well for us in the past. 1. The ceremony string quartet. If you're getting married at a different location from your reception (like a church, for example), it often makes sense to take a different approach for each. A string quartet or string trio can play traditional music for your offsite ceremony, while the DJ handles everything at the reception hall. 2. Strings for ceremony and cocktails; DJ for dancing. If your ceremony and reception are at the same location, you can usually hire the string ensemble to stay for an extra hour – at a fraction of the ceremony cost. Add or subtract an instrument, or find a group that’s strong in more than one genre of music, so that there’s still a stylistic change between your ceremony and cocktail times. 3. Jazz cocktails; DJ for the rest. First impressions are a big deal – and the tone set by your cocktail music tells guests what they can expect from the entire reception. Background “Muzak” in the hotel lobby while your guests arrive says one thing – a jazz trio grooving in the corner says something else. And if your ceremony is at the same location as your reception, your DJ can provide ceremony music too. 4. The live first dance. Some couples who book our pop strings quartet for their dinner time do so not just for the benefit of live music during dinner - but so the live ensemble can stay and play the first dance. It's a great way to set your first dance apart as something special, and your DJ can take over afterward when it's time rock the dance floor. 5. Classical ceremony, pop cocktails, jazz dinner. The most variety at Backthird comes from using two different live ensembles in addition to your DJ. It's possible to use a classical string ensemble for your ceremony, make it a pop string ensemble for your cocktail time, and then have a jazz group ready to play when your guests enter the main ballroom for dinner. Your DJ is still onhand to MC the celebration and to play dance music after dinner. And by totally changing up the music every hour or two, you ensure that there's always something new to keep your guests excited and engaged. Want more ideas? Follow the link below to see what 7 Backthird couples booked - and what it cost them, too.